Brief Synopsis – A new group of prisoners are chosen for a mission behind enemy lines. My Take on it – This film falls once again into the trap of the previous sequel in the series; it isn’t original enough to formulate its own true identity. Instead we feel that much of the original plot is rehashed here just with completely different characters. 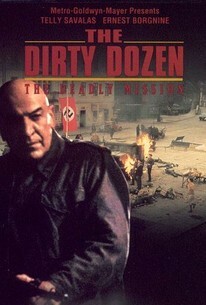 The choice of Telly Savalas as the lead in this film is an interesting one since he portrayed a completely different character in the original, but he still does a fine job imitating Lee Marvin’s gruff Major. The characters are slightly developed in this film more than in the previous one, but we still don’t get enough information about most of them to really care what will happen to them. Thankfully, there are one or two which we get to know better and are more curious about their potential survival. Unfortunately, this film mostly feels as if they are going through the motions instead of trying to give us something original and unexpected.